King Vira Vallalan III was an illustrious king who ruled over the Hoysala empire from 1292 till 1342. His empire at its peak covered a large part of South India. It had three capital cities, one of which was Tiruvannamalai, although it was then known as Arunasamudra, or Arunai for short. The king was an ardent Saivite and during his stays in Tiruvannamalai he made many improvements to the Arunachaleswarar Temple. Tiruvannamalai was near the geographical centre of his empire and this encouraged him to make protracted stays there, particularly after the destruction of Dwarasamudra. It seems that during the last fifteen years of his reign he was constantly in residence at Tiruvannamalai. 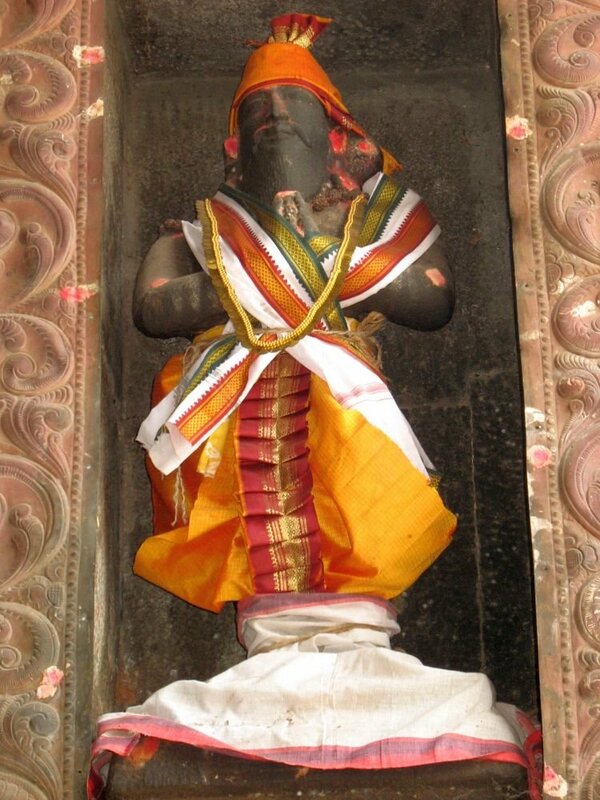 King Vallalan's devotion and piety are celebrated in chapter seven of the Arunachala Puranam, a Tamil poetical work that was written in the sixteenth century by Ellapa Nayinar. The work is primarily a poetical rendering of the Sanskrit Arunachala Mahatmyam which was written several centuries before, but the following verses, dealing with King Vallalan’s quest for a son, are only to be found in the Tamil version. Now we will tell you the story of King Vallalan to whom God Himself manifested as a child and then bestowed His grace by giving him a boon. In a famous place called Arunai (Tiruvannamalai) there are mansions with jewel-bedecked pinnacles and gardens dense with fruit-giving trees which reach up to the starry firmament. In this place dwell beautiful devadasis equal only to Arundhati (Vasishta’s wife) in chastity. Vallalan the king of this renowned city, has a virtuous character, speaks only the truth, and with great devotion takes care of all beings as if they were no different from him. He belongs to the Agni lineage whose fame cannot be described. This king came (to the world) to worship daily the feet of Parameswara, to do service to him and to praise him. He has no desire for the possessions of others. Excepting his own wives, he considers all other women as his sisters and treats them accordingly. In accordance with the law, he is given one sixth of his subjects’ earnings as taxes. He serves with great delight as a patron of the temple of the Lord who held the poison in his throat. In this place tigers and cows dwell together, drinking from the same tank. The Brahmin preceptors recite the Vedas, and all the people listen. To obtain grace from the ancient Lord, people decorate the city, making it a marvel to behold. Maidens sprinkle water in the street and make magnificent kolams (symmetrical patterns made out of rice flour). There are three rainfalls a month and the abundantly rich harvests never fail. Those who ask for food are immediately invited and offered food with the six different flavours. The people, by serving the tapasvins (those performing tapas) and giving whatever is asked of them, receive their blessings. In the temple of Siva, the Just One, they light ghee lamps and do puja regularly. Thus, the great city existed in all its splendour according to God's design. But even though the king had all possible wealth, he had a troubled mind because he had no son to speak his name. The king said, 'Will anyone ask for something that is not [available] in the world? Even if anyone did, no one could give such a thing. So, quickly do what I have ordered.' The ministers then hoisted the flag on high and struck the murasu. On hearing that the king of Arunai, where the Lord dwells, had hoisted a flag, people from all over the world drew near in great numbers to receive gifts that alleviated their poverty. There were old people, people carrying a kavadi [a pole with a weight on each end], tapasvins, brahmins chanting the Vedas, wandering minstrels, singers and beggars. To those who came and wanted to perform a marriage ceremony, the king gave 1,000 pon. In addition he made those who said that they were unable to redeem their pledges of houses, lands and jewels happy by giving them 2,000 pon. Afterwards, he gave 300 pon to old brahmins who wanted to perform the upanayanam [sacred thread] ceremony. 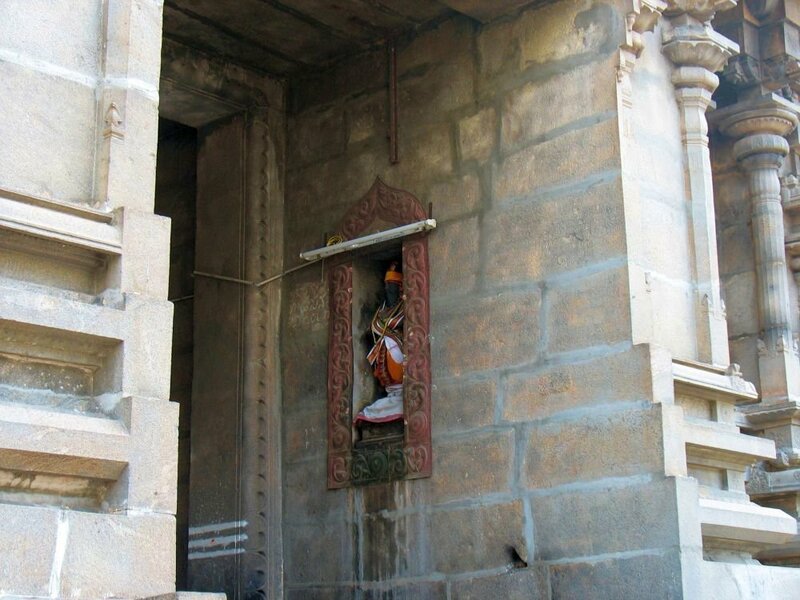 [Someone asked:] 'The jewelled mantapam and the compound wall in the temple are deteriorating. O Lord, give us funds to repair them.' The king gave 2,000 pon with great devotion and said, 'Renovate them properly'. In addition, 50,000 pon were given to endow maths throughout the land. [The sage] Narada, hearing that King Vallalan, as he proclaimed, was graciously bestowing gifts daily to blind people, to devotees of Siva, to the lame, to wandering minstrels, to those afflicted by the disease of poverty and [many] others, approached that king. When he heard about the arrival of the muni, the great tapasvin, the king with great love descended quickly from his throne and, surrounded by all his ministers, approached the holy man, singing his praises, received him, and offered him a seat free from all impurities. Once the muni was seated, the king began to speak. Listening to the discourse of the muni who had come before Him, Lord Siva thought, 'I will ascertain for Myself what this Vallalan is like'. Then the Peerless One said to the devas, rishis and munis, 'All of you go to your respective ashrams'. 'O king who rules Alakapuri, listen. I have decided to test the steadfastness of the king who dwells in Arunai. Therefore become My worthy disciple and accompany Me joyfully with lots of wealth.' Thus said the Lord of Kailash. Then Paramasiva, who shines with the indescribable Lady as one of His halves, took the form of a sangama [Saiva monk] that could now be worshipped by everyone. As Brahma and Vishnu looked on, they felt a joy they had never experienced before. All the devas showered forth a rain of flowers while the Vedas praised [Him]. All the beautiful Siva ganas dwelling in Kailash, the abode of the Lord became andis [mendicants] by the grace of our most excellent Lord Siva. Coming in a large group, they reached the beautiful city where Vallalan dwells and were praised by those who knew the ways of the king. The Lord, who had given up the deer He was holding to take on the appearance of a sangama, headed for the street in that excellent city wherein dwelled the devadasis, whose lips were like red fruit. His lily-like mouth blossomed, and He cried out like a beggar suffering terrible hunger. Siva immediately handed out the gold that the devadasis had demanded. Matching up one mendicant with each lady, he signalled to them with His eyes that they must stay together all night. Thus, in the city of Arunai, which grants many boons, Siva made the devadasi streets light up with the great assemblies of sangamas embracing all the devadasis. 'O sangama who teaches wisdom even to those who have made their minds steady, I shall act according to Your wish.' Then the king called his guards and said, 'Go immediately and fetch a beautiful devadasi'. 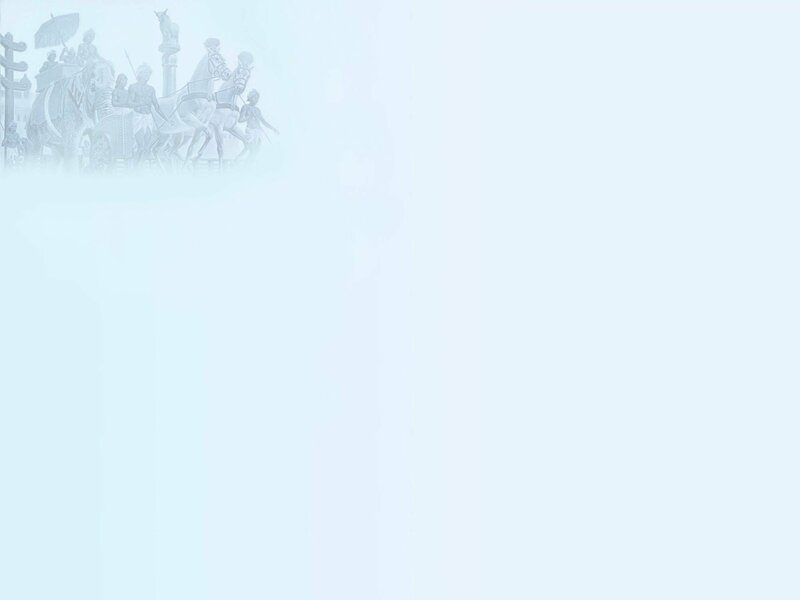 The guards set off faster than the wind. They reached the street where the devadasis lived and entered every house. Each time they looked inside the crowded houses they saw a devadasi dancing and singing affectionately with a Siva devotee wearing kondrai flowers. 'Today it won't be possible to find an available devadasi,' they thought, and returned to the palace to tell the king. After hearing what the ministers had said, the ladies humbly replied, 'We have already been paid by these devotees to stay with them all night. After this night is over, we will do what you say.' The ministers were much disturbed and reported what the devadasis had said to the king. The king said, 'Why is this insignificant thing becoming so difficult for us?' He grew sad and his mind was filled with anxious thoughts. 'Is this the working of the Lord's grace? I will fulfil my promise to the sangama who has appeared before us as if He was Siva Himself.' So saying, the king took his bow and quickly went to the street of the devadasis. The ladies humbly replied, 'Abiding by your laws, O Lord, we have already accepted the gold to have pleasure with these pure devotees. What else can we do?' The king of this land became ashamed and went back to his famous palace. 'Today a venerable man approached this prosperous king desiring pleasure with a woman having deer-like eyes. In accordance with his request, I tried to get a devadasi but none is available in our city. Because of this I am distressed.' After listening to the king, the younger wife began to speak. 'O king who has made a promise to the devotee suffering from lust, we don't know what is on your mind. If you think that I, the younger wife, should offer myself to him, then I shall do so.' The king, who was blessed by Lakshmi, rejoiced in his mind. He looked at his wife and said, 'O noble lady, you will go with the devotee into a room and remove the suffering inflicted on him by the formless Kama.' Then the good king informed the venerable man. Sallamadevi immediately bathed in perfumed water, dressed up beautifully and went inside the room. There she skillfully played the vina and sang melodiously. But when she came close to the Supreme One and looked at Him, she saw that the One who wore the rudraksha beads was deep in meditation. Then, thinking that she would make the Venerable One happy, she took perfumed water and sprinkled it over His dazzling form, speaking to Him in a pleasant manner. When He didn't even open His eyes to look at her, she hesitated a moment and then began to speak. 'O Lord, alas, is it proper that the king's promise should be uttered in vain?' Then the beautiful lady placidly bent over and embraced Him. At that very moment Paramasiva turned into a baby and, to make her happy, began to cry. When Siva became a child and was crying loudly, the king, thinking that this was the Lord's doing, came quickly, took the child in his arms, embraced it and lovingly kissed it on the forehead. But just as the king was so immersed in bliss, that Immaculate One disappeared. 'O Lord, will we ignorant ones know the working of Your divine will? O embodiment of Truth! You who have three eyes! You who are the Vedas and the Lord of the Vedas! Pure One! Is it to test us that You have appeared in the form of a child and then disappeared? What is our destiny now, O Great One?' The king, along with the queen, lamented in this way. 'O handsome king, listen! I myself became your son. Hence, at the time of your death, I will perform the vedic ritual for you.' So saying, the One bearing the crescent moon blessed the king and returned to Kailash. Thereafter King Vallalan ruled the land with great virtue. Apart from this text, there is no other historical evidence to support the main contention of the story: that King Vallalan, in his efforts to conceive a son by being generous to all Siva devotees, obtained darshan of Lord Siva along with a promise that the Lord would personally conduct his funeral rites. However, there is incontestable proof that he was a major patron of the Arunachaleswarar Temple (verse 466) since the additions made are still very much in evidence. One of the inner gopurams bears his name was constructed at his behest. 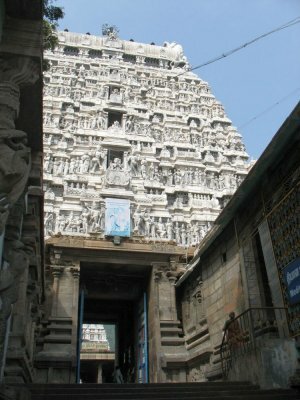 According to a traditional story which is well-known in Tiruvannamalai, King Vallalan, after building this gopuram, felt great pride in his achievement. Lord Arunachaleswarar noticing that the feeling ‘I have built this great gopuram’, was strongly rooted inside him, decided to teach him a lesson. There is a ten-day festival in which Arunachaleswarar is paraded each day through the streets of Tiruvannamalai. In the first festival after the gopuram had been built, Arunachaleswarar initially refused to leave the temple via the passage in the centre of the new gopuram. For the first nine days of the festival He always left the temple via a different route. On the tenth and last day the king realised his mistake and became more humble. He broke down and cried before the Lord, begging him to use the new gopuram for just one day. Lord Arunachaleswarar saw that the king’s pride had abated and granted his request. This particular festival is still celebrated in Tiruvannamalai. To commemorate King Vallalan’s attack of pride and his subsequent humility, Arunachaleswarar is only taken through the king’s gopuram on the tenth and final day. On the other days other routes are used. The results of King Vallalan’s patronage can also be seen in other parts of the temple. There are several statues of him there, one showing him with a full beard, another showing him with one of his queens and a third as an old man. 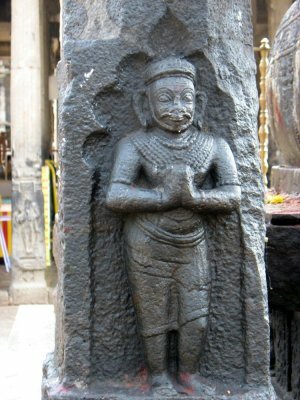 In the sixteen-pillared mantapam outside the temple there is another statue of one of his queens in which she is standing on a projecting platform, supported by lions’ heads, with her hands folded in supplication towards an image of Siva and Parvati seated on a Nandi. 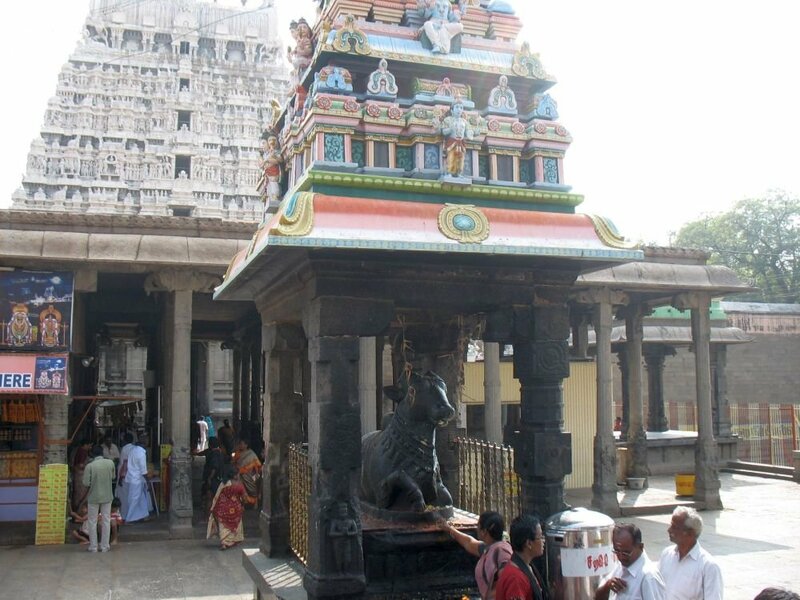 He was also responsible for the Nandi which was installed to the east of the Kiligopuram. This particular Nandi is covered with a small mantapam. On the right hand pillar there is a carving of King Vallalan and on the left-hand pillar there is a carving of the ganda berunda, the imperial emblem of the Hoysalas. In the concluding verse of the chapter, Siva undertakes to perform King Vallalan’s funeral rites for him, a task which is normally performed by the son of the deceased. The promise is still remembered in Tiruvannamalai and each year King Vallalan’s funeral is re-enacted to commemorate the event. In the month of Masi the temple priests read out the news of King Vallalan’s death to Arunachaleswarar. Then the image is carried in procession to the village of Pallikonda Pattu, about three kilometres from Tiruvannamalai, for the performance of the king’s annual sraddha rites. The connection between Pallikonda Pattu and the life and death of King Vallalan is no longer known. It is unlikely that he lived there since his palace is thought to have been located about a mile to the east of the main temple. Until about a hundred years ago the last remains of what was reputed to be his palace could still be seen there, but around the turn of the century the land was levelled and cultivated and the railway line from Villupuram to Tirupathi now runs across the site. Whether through divine intervention or mere accident, King Vallalan eventually fathered two sons, Virupaksha and Thipparasa, and a daughter whom he married to one of his ministers. Virupaksha succeeded to the throne after his father’s death but he was unable to retain control of his inheritance. One of Vallalan’s generals, Harihara, was sufficiently powerful to operate independently of the new king. With the aid of his two brothers, Kampa and Bukka, he defeated all the neighbouring kingdoms, founded the Vijaynagar empire, which included the Hoysala territories, and, under the title of Harihara I, became its first king. Throughout the Arunachaleswarar Temple there are tributes and reminders of King Vallalan. One of the major Gopurams at the Temple is the Vallala Gopuram. In front of the Gopuram is a small statue of Nandi. And upon one of the columns of the Nandi platorm is a sculpture of King Vallalan. High in a niche on the right side of the walkway through the Gopuram is a statue of the King, which is daily maintained by the Temple priests. And close up, to view a very good representation of the loved ruler.